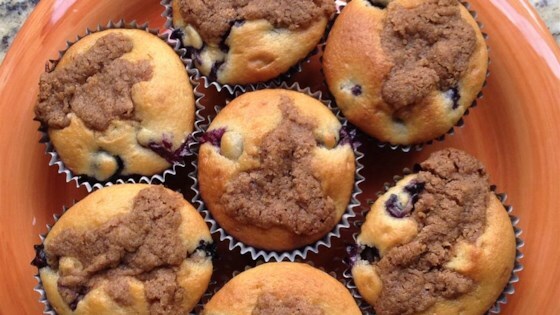 "Perfect blueberry muffins with a sweet brown sugar crumb baked icing. Especially moist and lovely when served warm." In a large bowl, mix together the flour, white and brown sugars, salt, and baking powder. Stir in oil, eggs, and milk until well blended and very few lumps remain. Gently fold in blueberries being careful not to mash them. Fill muffin tins 2/3 full, or slightly more for a larger muffin top.